18 IAIA Students and several staff and faculty traveled to Billing, Montana, to compete at the 2019 American Indian Higher Education Consortium (AIHEC) Conference, March 16–19. 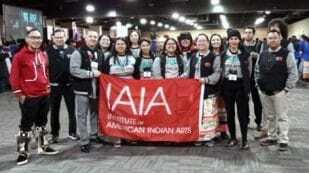 13 of the 18 IAIA Students won awards in hand games, knowledge bowl, archery, traditional plant, art, and other categories, and some of the students won multiple awards at the conference—IAIA’s students are always well-prepared and ready to compete and win. In 2020, the AIHEC Conference will take place in Albuquerque, and the last time the conference was there, IAIA students won 55 overall awards. Bryson Meyers and Caleigh Benally were selected to be in the AIHEC Student Congress (ASC). The American Indian Higher Education Consortium (AIHEC) is the collective spirit and unifying voice of the nation’s 37 Tribal Colleges and Universities (TCUs)—a unique community of tribally and federally chartered institutions working to strengthen tribal nations and make a lasting difference in the lives of American Indians and Alaska Natives. Since 1973, AIHEC serves its network of member institutions through public policy, advocacy, research, and program initiatives to ensure strong tribal sovereignty through excellence in American Indian higher education. At the 2019 AIHEC Student Conference, each of the 37 AIHEC institutions were represented by a broad array of students, faculty, and staff from tribal nations throughout the United States. Students engaged in competitions designed to foster strong academic achievements in STEM, history, literature, and the arts. The event brought together future leaders of Indian Country and served as a national gathering and training ground for Native youth. The 2019 AIHEC Student Conference was held in Billings, Montana.